Fast forward to last week's forecasts from the Office for Budget Responsibility. Buried in the small print (actually found in tab 1.8 of the ‘Supplementary Economy Tables’ spreadsheet) was a forecast that the UK’s personal indebtedness is set to worsen considerably. As Labour MP Chuka Umunna highlighted at the Treasury Select Committee earlier today, it shows that household debt is set to rise from £1,560bn in 2010 (160% of household income) to £2,126bn in 2015 (175% of income) – an increase of 36.3%. By 2015 UK households will have amassed over two trillion pounds worth of debt. The household debt-to-income ratio (the best measure of how manageable the debt burden is) fell from 2007 until 2010. It is now forecast to start rising again. Osborne described pre-crisis household debt-to-income ratios as unsustainable – and yet the ratio is forecast to hit a new all-time high in 2015. More damagingly for Osborne, the OBR forecast for June 2010 (pdf) – before his first budget – predicted that household debt in 2014 would stand at £1,718bn. 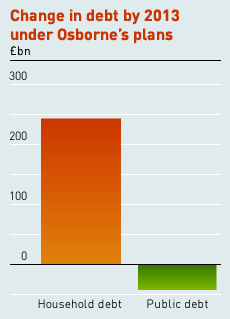 But following two Osborne budgets that number has now been revised up to £1,963bn – an increase of £245bn. In other words as a result of Osborne’s policies the direct debt burden on UK households is set to increase by nearly a quarter of a trillion pounds in the next three years. Back in June last year, before Osborne’s policy changes, the OBR forecast (pdf) that public sector net debt (government debt) would be £1,294bn in 2013/14. After two budgets and a spending review they have revised that (pdf) to £1,251bn – a reduction of only £43bn. Here we can clearly see the impact of Osborne’s changes over the next three years: public debt down by £43bn BUT private household debt up by £245bn – five times as much. Given the tax and benefit changes Osborne is presiding over, households have little choice but to borrow more to make ends meet. And that is how Osborne plans to drive down public debt: by increasing the household debt that helped cause the crisis in the first place. Update 27/4/11: For a correction to this article and further discussion, see the author's post "Household Debt (Again)".